Fringe is so fun! I bit late, but here's the look I wore on NYE. It would be a great outfit for any night out or special occasion. 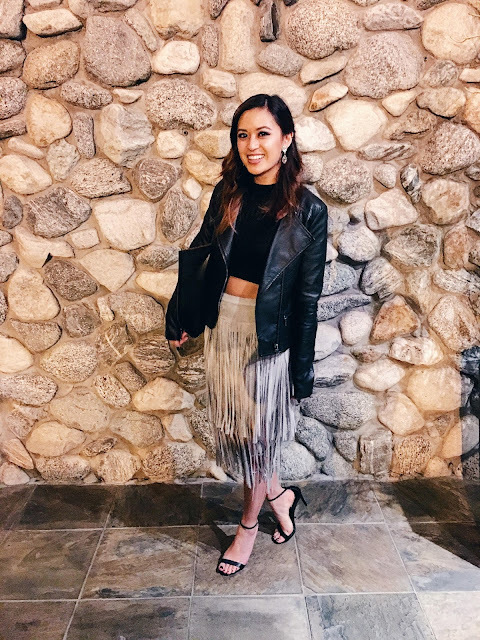 This is the Great Plains Grey Suede Fringe Skirt from LuLu's. I knew I had to pair this statement skirt with more subtle details. I opted for a sweater cropped tank and my go to Member's Only leather jacket. The shoes are the Stacey from Steve Madden. Check the product below to get the look.